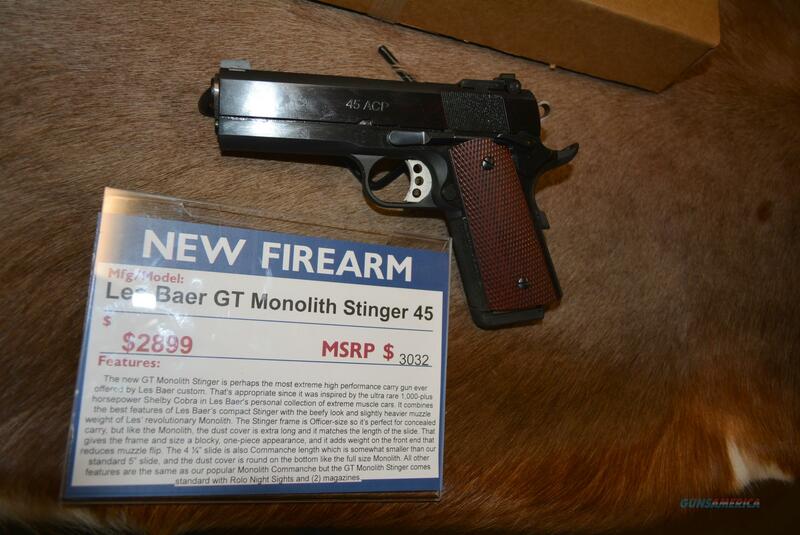 The new GT Monolith Stinger is perhaps the most extreme high performance carry gun ever offered by Les Baer custom. That's appropriate since it was inspired by the ultra rare 1,000-plus horsepower Shelby Cobra in Les Baer's personal collection of extreme muscle cars. It combines the best features of Les Baer’s compact Stinger with the beefy look and slightly heavier muzzle weight of Les’ revolutionary Monolith. The Stinger frame is Officer-size so it’s perfect for concealed carry, but like the Monolith, the dust cover is extra long and it matches the length of the slide. That gives the frame and size a blocky, one-piece appearance, and it adds weight on the front end that reduces muzzle flip. The 4 ¼” slide is also Commanche length which is somewhat smaller than our standard 5” slide, and the dust cover is round on the bottom like the full size Monolith. All other features are the same as our popular Monolith Commanche but the GT Monolith Stinger comes standard with Rolo Night Sights and (2) magazines. We try to take photos to show condition. We do not test fire used firearms. The seller assumes no liability in connection with the sale. All new firearms are warranted by their respective manufacturer. All used firearms should be examined by a licensed gunsmith before firing.